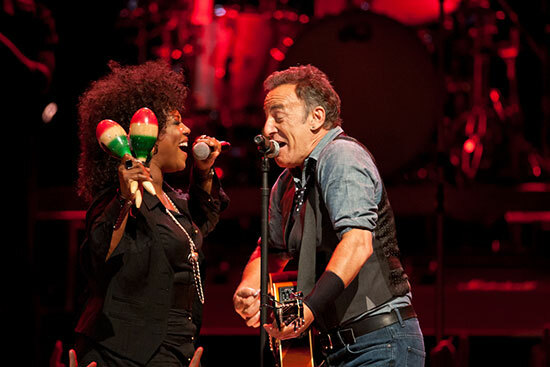 Bruce has never performed 'Me and my baby got our own thing going' but Cindy Mizelle recites the first verse from the song at the end of Shackled and drawn. On the studio version and on live versions. I want everybody to stand up and be counted tonight..."
' Me and my baby got our own thing going ' is a song written by James Brown and Lyn Collins and released by Collins in 1972 as a single. The song was included as a bonus track on a Japanese CD reissue of Collins' 1975 album Check Me Out If You Don't Know Me By Now. According to the original 1972 single label, the song is titled "Me And My Baby Got A Good Thing Going" and is credited to James Brown and Lyn Collins. However, the song is filed at the U.S. 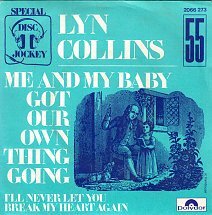 Copyright Office under the title "Me And My Baby Got Our Own Thing Going" (which corresponds to the lyrics) and is credited to James Brown, Lynn Collins, Fred Wesley, and Charles Bobbit. According to original 1972 single label, the latter two are also the writers of the single's B-side ' I'll never let you break my heart again' .